Hero Destini 125 is already the brand’s best selling scooter, in just 3 months. It competes with the likes of Suzuki Access 125 and Honda Activa 125. Hero Destini 125 is the latest offering from the brand. It was launched in October 2018 and has already achieved success soon enough. It is currently, the best selling Hero scooter. Priced from Rs 54,650 (ex-showroom Delhi), it is one of the most affordable offering in its segment. It competes with the likes of Honda Activa 125 and Suzuki Access 125 in the family buyers-focused 125cc segment. 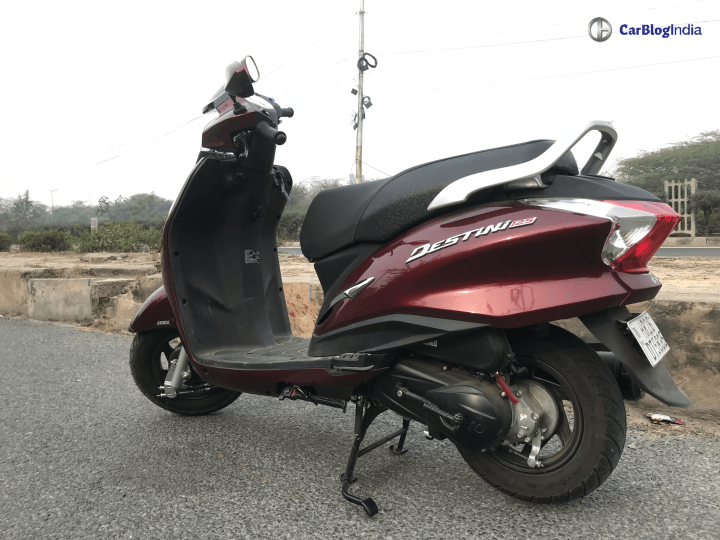 For the month of December 2018, Hero sold 17,364 units of Destini 125. For the same month, Hero sold 6281 units of Maestro, 6725 units of Pleasure and 5,511 units of Duet. The sales have dipped for the past few months by a huge margin. Hero Destini 125 comes in two variants – LX and VX. The LX variant goes for Rs 54,650 and VX goes for Rs 57,500. The base variant is cheaper than Access 125 by around Rs 2,000 and the higher variant is cheaper than Activa 125 by around Rs 3,000. Also, Hero has equipped the Destini 125 is its trademark i3S (Start-Stop system), which is a segment first. Basically, this system switches off the engine if kept idle for 5 seconds. To resume the riding, you have to press the clutch and rev up. The brand claims a mileage figure of 51 kmpl for this scooter. Even when we did our road test over Destini, the average mileage was 50 kmpl. The i3S system helps in maintaining the mileage to some bit. Hero Destini 125 is equipped with a 124.6cc engine that delivers 8.7 BHP and 10.2 Nm of peak torque. Hero has tuned this engine to deliver a linear acceleration and an overall stable performance. Features onboard include service indicator, side stand indicator, boot lamp, charging port, External key opening for boot and fuel cap and an external fuel filler cap. However, it misses out on an optional front disc brake. Soon, Hero is also going to launch the Maestro Edge 125 in India. It was showcased at the 2018 Auto Expo along with Destini 125. Maestro will be a more premium offering than the Destini 125. The engine and cycle parts will be the same, but as the current Maestro, it will look a bit more premium. The 125cc engine will also receive some tuning for better performance.